Are Vancouver condos in for a major correction this year? Dane Eitel thinks so and he has successfully forecasted Vancouver’s real estate market before. After putting forth some bold predictions about the detached market last year, Dane is back by popular demand to do the same for attached. Dane joins Adam & Matt to discuss his findings, respond to his critics, and offer some no-nonsense predictions for this year and beyond. Dane is the founder and lead analyst of Eitel Insights, a real estate analytics firm based in Vancouver. Eitel insights has recently released analytics on the detached housing and condo markets in the greater Vancouver area. Generally, economists, banks and others that provide real estate analytics are purposefully vague on where the market is headed. They use fundamental data that inherently lags the actual market and they do not provide exact numbers. They talk about trends, but there is no exactness to their forecasts. Eitel Insights calls the bottom of the market and the peak of the market and can advise clients on when to buy and when to sell. They give real life numbers and forecasts that are useful for clients to make real time investments decisions. Eitel Insights is currently rolling out reports across Canada in the near future. Dane was previously on the Vancouver Real Estate Podcast (Episode 142). 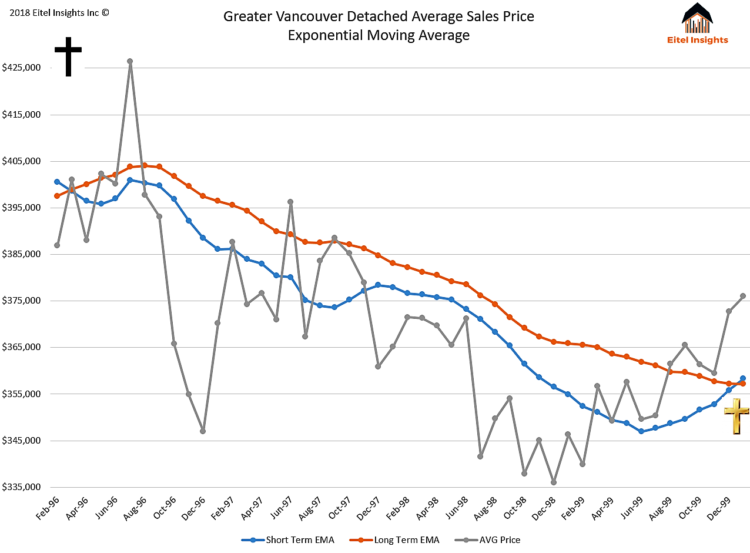 The detached market in Vancouver is currently in a death cross. Dane relies on exponential moving averages, which are based on a 1 and a 2-year basis (short- and longer-term momentum). The detached market has been in a golden cross scenario over the last 5 years – resulting in a 60% increase in prices over this time period. In November 2018, this market crossed over into a death cross scenario, suggesting the market will be decreasing in near future. The average sale price for detached homes in Vancouver will bottom out at $1.4M, which would be approx. $300K or 17% decrease from where the average sale price is today (approx. $1.7M). Eitel insights uses analysis that is historically used to analyze the stock market. How do you respond to people that argue that the stock market analysis you are using fundamentally doesn’t work in a housing market? Dane is not aware of too many instances of people using the same analysis techniques that he is using on a housing market. 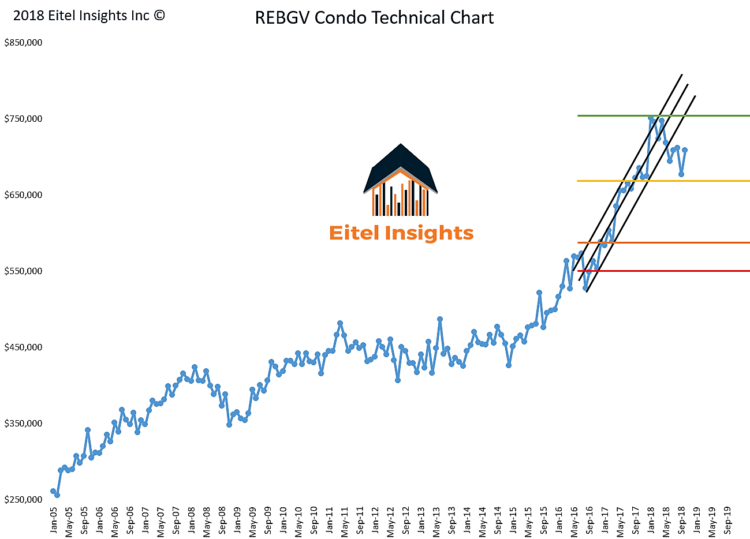 Eitel Insights short term predictions have been very accurate (within 2-3%) and follow the technical indicator chart they created. He knows this is a viable way to analyze the Vancouver market. In a hot real estate market like Vancouver, even regular home buyers are riding the same wave as speculators and investors. Eitel Insights offers reports for $250 for anyone that is interested in purchasing in Vancouver – which will provide buyers will additional information that will be helpful to them. Regular people have their own reasons for wanting to buy a home that might not be determined by market projections, but by if they can afford to buy today, if they qualify for a mortgage, etc. These people may still want to buy real estate if it makes sense to them. For larger investors looking to make money on market appreciation, this is a different conversation and today is not be the best time to buy and they may need to look to other Canadian markets outside of Vancouver. The methodology works because there are psychological factors that are prevalent in any market. Speculation in markets goes back to ancient civilizations where people would horde rice during the rainy season to sell during the dry season at inflated prices – which you can literally chart mathematically. Yes, the stock market is different than the housing market because it has greater liquidity than the housing market (you can sell a stock immediately) and the stock market has some people trading using technical analysis or others trading using fundamental information. In a real estate market, even with the investors and the home buyers both engaged in real estate transactions, if you use averages, you can still chart the real estate market just like you can the stock market and make accurate predictions about it. At the end of 2018, the peak of the average price in the Vancouver detached market was $1.83M. Going forward, we will see the inventory and the demand start to separate themselves. December 2018’s supply / demand numbers are equal to the worst month of the recession of 2008 and 2009, but people are not panicking like they were back in 2008. This leads us to believe the worst is yet to come in terms of pricing and phycological factors in the market. Over the next year, the market will dip lower and the average price will continue to drop ($1.6m-$1.7m range). As we enter into 2020, the market will break the 11 year up trend, which should happen in the first quarter of 2020. This will break the $1.6M price and then drop quickly to the $1.4M average sales price for detached single family homes in Vancouver. In 2021 the price will hover in the $1.4M and $1.5M range – this will be the bottom of the market for a number of reasons: 1) In 2021 we will have filled out the selling range and the market can start to propel itself higher 2) this is when many people that purchased in 2016 at the zenith will be up for renewal on their 5-year fixed mortgages. The bank will work with you, unless you continued to leverage yourself by buying a speed boat, car or additional properties. In 2021, the market will have dropped $430K from the average price high of 2018 and investors will start to dip their toes back in. Prices will start to increase in late 2021 and 2022 ($1.5M or $1.6M). By late 2023, the market will be back to the $1.83M level. November took a massive drop from November to December. This generally happens at Christmas and you will see a natural effect of people listing their homes in January, as people know the best time to sell is in the Spring. Sales volumes will increase from December, but we will not get anywhere near the frenzied activity of the past. Eventually, the inventory volume will be too great, and their will be houses on nice streets available for extended periods of time that were not available before. The psychological factors will kick in and people will decide it is not a great time to buy real estate because there are 2-3 houses on that street where there were never any listings available before. The market will dry up due to the overload of inventory. Not everyone needs to sell, but some people do need to sell. The people that are overleveraged will just take what they need to get out of their situation, and this will propel the market lower. Inventory volume will increase to levels we have seen in previous recession times. It will be normal to see nice homes on the market for 30-60 days. If you don’t have to sell – ride it out, you don’t have to sell. If we are talking investors, Vancouver is not the only game in town. There are other areas in Canada that are poised for growth right now that would be a better investment than greater Vancouver. Eitel Insights can break down the stats for areas of Vancouver if someone wants that information but can also offer Canada wide stats. The long-term forecast for Vancouver is still positive – by 2028 detached homes will be at an average price of $2.8M. Eitel Insights has recently released their analysis on the Condo Market in Greater Vancouver. At this time, the condo market has peaked and there will be no more price increases. There was a growth phase from Q4 of 2016 to Q2 of 2018. The top average price was $750K. We are currently seeing a base of $650K threshold where the condo market will begin to test this price. The definitive downtrend will need to establish itself over the next couple of months. The bottom will be the same as Q4 2016, which will be $550K. When this price is reached, the market will eventually start to run again. The condo market timelines will lag the detached market and take a bit longer to turn around. Overall it will be approximately a 30% decrease in prices. The condo market is currently at the end of the golden cross scenario but will enter a death cross scenario soon. The condo market is not investable at this time, so investors should look to other markets. In 2021, 2022 there will be a lot of new condo inventory entering the market due to presales completing. Some new presales are not selling out at this point and it will be difficult for developers to meet their numbers and continue to build. When the new condos are available for sale at reduced prices, the older 15-year-old condos that may need some work will be tough to sell versus the new condos. This will force the lower prices to the resale market, which will propel the market lower. When the buildings are a little bit older, after the building has undertook some renovations and updated the amenities, those older properties will start to become attractive to buyers over the new condos – mainly because they are similar a new building with larger square footage. Buyers will turn to older condos, forcing the price of the new condos to decrease. This will lead to a race to the bottom for the condo market. The stress test also affects the condo market and the people that might have helped you with your down payment in the past will be more reluctant to pull equity out of their property to help you now. That being said, new home buyers today that plan to purchase and live in a good condo property can ride out the market. It is still advisable to buy real estate if you need to. It is still better to be paying down your own mortgage than your land lords’ mortgage. Nothing that we can see that the market would zero or that the market would run away. The analysis is unemotional – based on averages of large numbers of people. This is what people in the market on average think. In terms of the market rising in the short term, there is nothing in the analytics to support this, but you can also look anecdotally. Is there anything on the horizon that would support a price increase in the market like a new building or the Olympics? 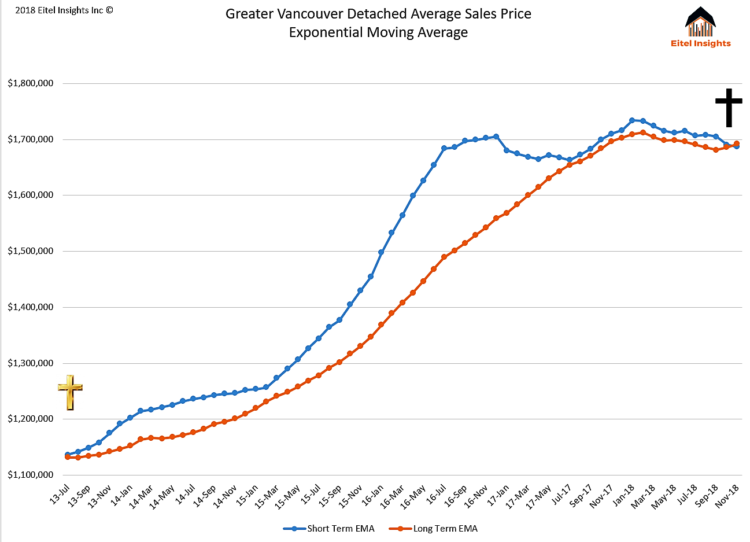 The answer is no so this suggests there will not be a short-term price increase for Vancouver. Eitel Insights offers reports for any city or area for $250 on their website. They will be releasing Toronto very soon – where the market is stable and decent and trending higher at this time. Toronto looks similar to 2017 in Vancouver. They have had short term-losses, but the market appears to be poised for some growth. Going forward though, ultimately Toronto will see greater inventory and lower prices. Toronto and Vancouver are each to their own markets and do not lead each other. A positive area of note is Halifax. Halifax has recently broken through its peak pricing threshold from the past. The prices in Halifax are a lot lower than Vancouver, so investors can buy 2-3 units in an area that is poised for growth right now. It is also the next city getting a CFL team, which suggests the technical analysis agrees with the fundamentals. Fort McMurray is another positive area. It has recently had some issues with the oil patch and forest fires. The market had dropped $350K but it has now bottomed. It is currently in the basin for prices and it will rise back to the pricing levels before it fell on hard times. The fundamentals are not quite there yet, but in two years, you will see economists touting this area as a place to invest after the fundamentals catch up with the technical analysis. This is where the advantage lies by using Eitel Insights – Eitel Insights can tell you to buy there now before the rest of the real estate community determines this is an area to invest. next post: Presale Vs Resale & 7 Pro-Tips that Will Save You Money!